Thanks, Xenia. Yesterday was quite the exciting day for us. Oh yes, most definitely these are Sandhill Cranes…here in New Mexico, we are in a Sandhill flyway between Canada and Mexico, we see many, many cranes…they are very majestic and have a distinctive call…I didn’t know the cranes were in Maine…interesting…what a fun post. Thanks for the confirmation, Jeanne. I never, never thought I would get to see one. Let’s just say they are not common in Maine. Wow, WAY out of range. I suggest you report this sighting to e-bird.org. It would be of great scientific interest and you have photos to prove the sighting. Kudos! Quite an amazing sighting, for sure. It was, and since I posted this piece, I learned that there are pairs nesting in Maine. Oh, brave new world! Yes, more than hope. A very strong likelihood, is my guess. I just did an online search and learned that cranes have been seen in central Maine since 2000 and are increasing. That is really exciting. Central Maine, Auburn to Falmouth seems to be THE place to see them. Lucky you! Good thing you weren’t driving, you might have run off the road. 🙂 Great catch – truly exciting. That pizza looks wicked good, and I love coleus. Definitely a good week. You got that right! Oh, to see those birds. One of the really good days. That pizza looked tasty. The pizza was very tasty, and seeing those birds was quite a thrill. Yes, those are Sand Hill Cranes. Denny and I kayaked down Torsey Pond a few weeks ago to se them. They nest on the boggy islands in the middle of the lake. My birding friends tell me they have been nesting in our area for about 5-6 years. Aren’t they wonderful? They are indeed wonderful! 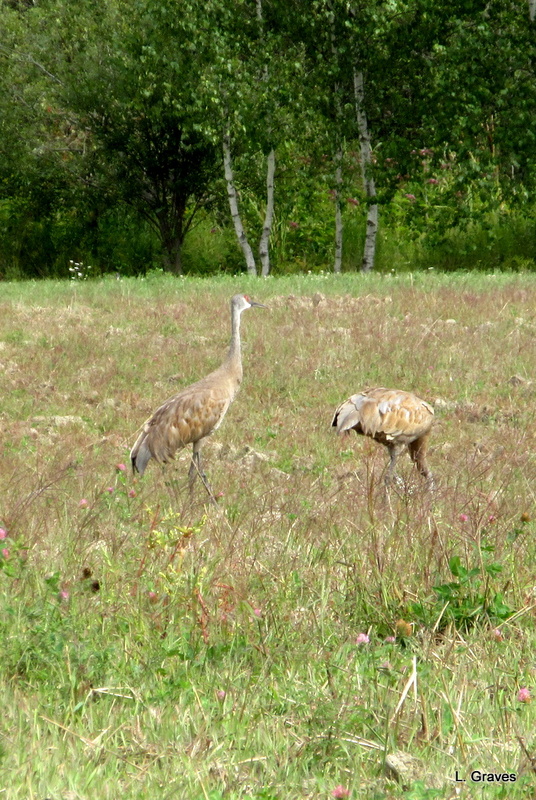 And I never, ever thought we’d get sandhill cranes in Maine. What next? I would have been excited also if I had seen those birds. Yes, I would like one piece of that yummy looking pizza, it’s been a while since I made one, must make one now you have got my juices going. Many thanks! It is a day I will never forget. J > That’s a basket-full of things I’d be quite pleased about, too! Wowsah is right! Beautiful birds. So beautiful, especially in flight. Lovely things all, but especially the cranes. A thrill to see them, especially as they flew. How wonderful that you saw the cranes! I thought I spotted one last year, (still not sure) and did a little research. Here’s an interesting article on their presence in Maine: http://www.pressherald.com/2016/07/24/cranes-find-new-breeding-ground-in-maine/ We were fortunate to see loads of Sandhill Cranes in Alaska–their migration marked the seasons. They are magnificent birds. Have a wonderful Labor Day weekend! What a day! After posting the picture of the cranes on my blog and Facebook, I did indeed discover that there are pairs nesting in Maine. First cardinals, then red-bellied woodpeckers, and now sandhill cranes. What will be next, I wonder? How exciting! I would love to see such majestic birds close up! 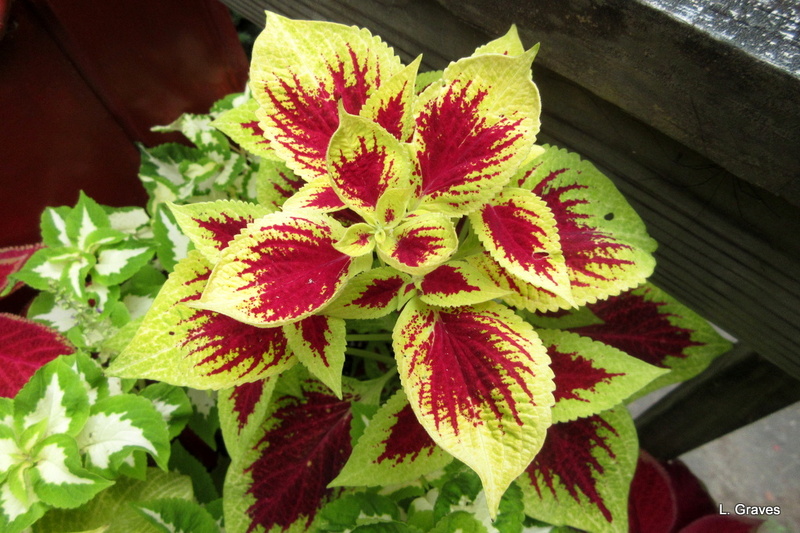 The pizza looks really delicious and coleus too – what attractive, bright and cheerful foliage. It was quite a day. I’ve ordered photos of the cranes to make cards. “Prepared mind”, what a concept! Sandhill Cranes in Maine? Hmmm, maybe taking the Eastern migration route because of bad weather in Texas? No, I think those cranes have just made advances into Maine. Just like the cardinals have and the red-bellied woodpeckers. A silver lining to the cloud of climate change? Very exciting to see Sandhill Cranes – I have never seen one. And the pizza looks very good, but – cheddar cheese? So exciting! And, yes, cheddar. Clif likes to put a mixture of cheeses on his pizza, and to quote my Yankee husband, it tastes pretty darned good. 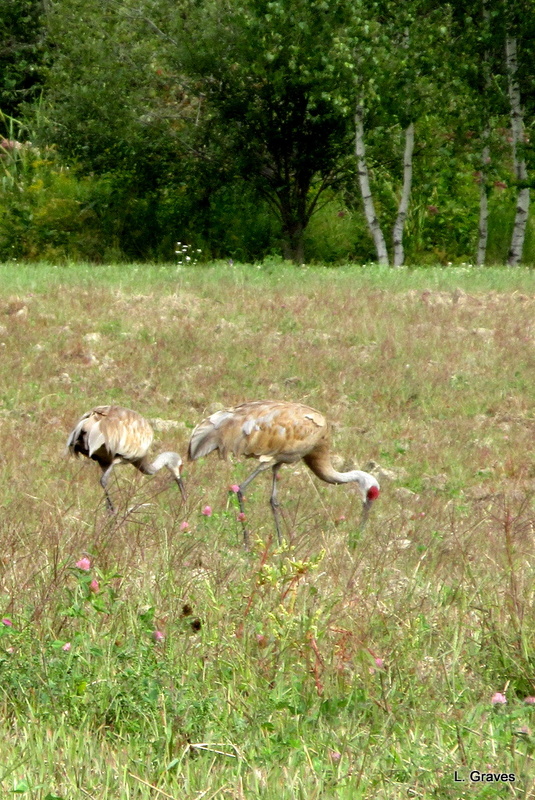 I have seen sandhill cranes in Michigan but would love to see them in Maine. Beautiful pictures. You know, you just might someday. The cranes must have been great to see. 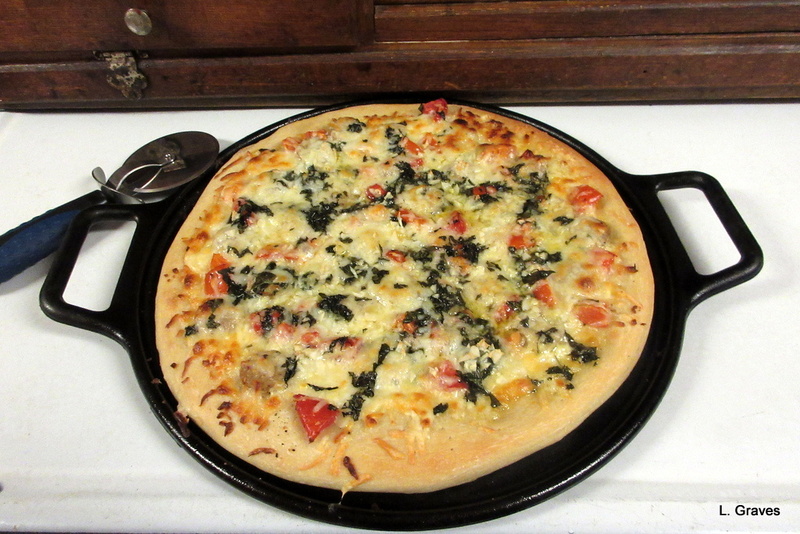 Pizza looks good too – you are lucky having Clif!